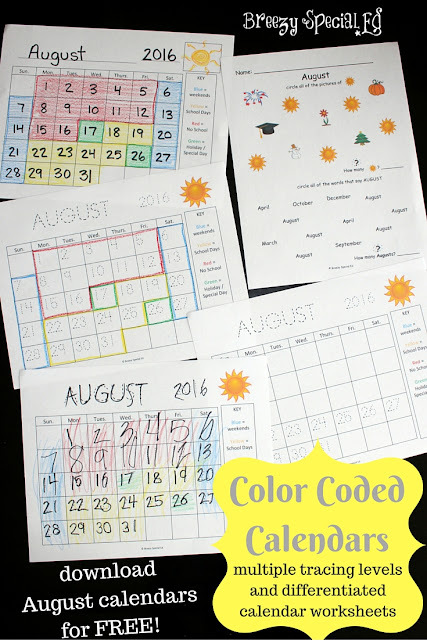 Whenever we are about to start a new month, it's time to prepare our color coded calendars! These are ESSENTIAL in my special education classroom. My students absolutely love filling out and coloring their calendars as it really helps them know what to expect for the month. Time can be such a tricky concept to teach...what exactly does tomorrow mean? When we have a field trip at the end of the month, how long do we actually have to wait for it? Using these calendars daily helps students better understand the concept of time, days, and calendars. Students fill out their calendars using the level of support they need, whether it is tracing all of the numbers, writing half (either 2-10 or 2-20, I always include the 1 so they know where to begin) and tracing the higher numbers, or writing all of the numbers by themselves. This is great number and writing practice. When it is time to color code our calendars, I like to make my students pay attention and copy the example I do in the front of the class or fill it out simply by my explanation, such as "The 26th is a special day, we have a school assembly! Color that date green." For my students who can't follow along with this yet, I outline the dates in the correct color before they trace/write their numbers so they can follow along with the level of support that they need. Once students complete their calendar for the month, I have them hole punch and put it in their binder under the calendar tab. Each morning, during our morning meeting time, we open our binders to our calendar pages and cross off the days that have passed. We also use this time to talk about what has happened and what is coming up. The colors are a great visual way to talk about events and time passing. For additional calendar practice for my higher level students, I have a worksheet that asks questions about the calendar, such as "How many days are in this month? ", "How many Tuesdays? ", "What holidays/special events are happening this month? ", etc. You can also have students write a paragraph about what they are looking forward to in the upcoming month. I also have worksheets that work on writing the months, matching months to their picture or abbreviation by cut and paste, and a worksheet for each month that works on picture identification and/or word identification (as seen above). Some of my students are more accurate when they count and write at the same time, so you can see in the example above, the numbers are written in each picture or word. For my students who aren't able to recognize words yet, I just cut off the bottom portion of the worksheet or have them try their best! 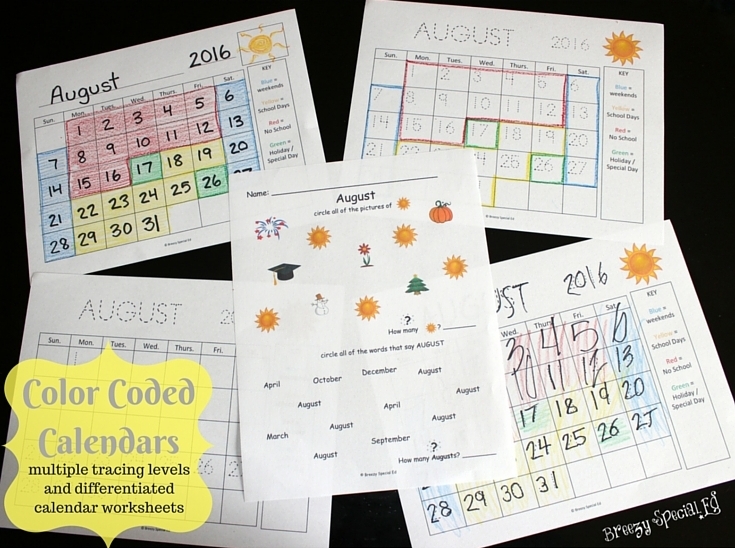 Using these calendars has seriously been a lifesaver for my students. I even have a few students make two so that their parents can use them at home with them as well! These calendars have just been updated for the 2016-17 school year and you can download the preview here in order to try out the August calendars for free! This post has been featured on the TeachersPayTeachers blog!